A visit to annual convention is a big opportunity to pour out your passions by collecting rare products at the best prices. 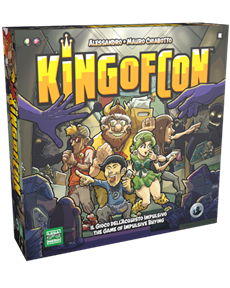 Closing the best deals and completing your collection will get you the title of King of Con - in the upcoming game by Lega Nerd! In King of Con players manage their resources, influence the market supply with demands and try to get the best items through 3 rounds of auctions. Collecting objects will allow you to earn victory points, especially if they fit your secret passions, but also prestige, which expresses itself in new resources to buy other pieces of your collection. Try the game on Tabletopia and support it's first physical release through Kickstarter!